Across the country, everyday citizens are engaged in scientific and technological pursuits. They do this in many ways: by inventing in backyards and garages, by taking part in large citizen science projects or by conducting self-experimentation. Defined by OpenScientist, these citizen scientists are people, "who participate in the systematic collection and analysis of data; development of technology; testing of natural phenomena; and the dissemination of these activities on an avocational basis." By this definition, one of the greatest citizen scientists of all time was Benjamin Franklin. Going even further, Franklin embodied one of the purest definitions of a scientist: someone who thinks about the nature of the world in order to devise ways to better the lives of others. In this, he was incredibly successful. American Scientist's Shawn Carlson insists, "Franklin was the first person to prove that pure science could benefit ordinary people." first to chart the Gulf Stream. 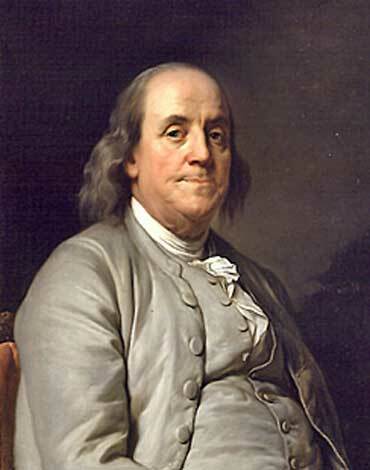 Franklin invented the lightning rod, bifocal glasses, and the flexible urinary catheter. He patented none of them, saying, "...as we enjoy great advantages from the inventions of others, we should be glad of an opportunity to serve others by any invention of ours; and this we should do freely and generously." lengthened at pleasure even beyond the antediluvian standard..."
Long before the Wright Brother's legendary first flight, Franklin seemingly portended the rise of modern-day airlines. His predictions on agriculture and disease -- though somewhat vague -- were also sowed into reality with the invention of agricultural machinery, genetic modification, refined planting techniques, vaccinations, antibiotics and modern medicine. Franklin was, however, incorrect on human longevity. The 'antediluvian standard' he described refers to the ages of the Hebrew patriarchs in the Old Testament, whose lifespans extended past 900 years. Though the ages of modern humans can reach into the triple digits, we aren't even remotely close to that divine standard. For all of Franklin's accomplishments, we must be in awe of the man. Once the awe settles, we can learn from him an empowering lesson: Your planet, your town, your home, can serve as your laboratory. We live in a very different time from Mr. Franklin, but it still holds true that citizen scientists have the power to move humankind forward. You don't need to have advanced degrees or be published in peer-reviewed journals; you just have to be driven and curious.